Senior Iranian commander says that any American attack on Iran will result in “the annihilation of the Israeli regime”. A senior Iranian commander threatened on Friday that any American attack on Iran will result in “the annihilation of the Israeli regime”. “They know that aggression against the Islamic Republic of Iran would mean annihilation of Tel Aviv and spread of war into the United States,” the commander, Massoud Jazayeri, was quoted by the Fars news agency as having said. His remarks came after U.S. President Barack Obama said on Wednesday that there is an opportunity to resolve disputes over Iran’s nuclear energy program but reiterated that Washington reserves “all options” against Iran, alluding to military action. Jazayeri described Obama’s remarks as “childish dreams which may not come true”. “Had the U.S. and its allies the capability to attack Iran they would not hesitate a moment to carry out their barbaric act; and, of course, it is surprising that Obama is not embarrassed to rehash his empty words,” he said. The Iranian commander said that the era of global hegemony has ended, adding that the “empire of money and weapons” will soon collapse. Over the years, Iran has threatened Israel and the United States on more than one occasion. In March, a senior commander in Iran’s Revolutionary Guards said that Iran is keeping its finger on the trigger and is ready to destroy Israel. 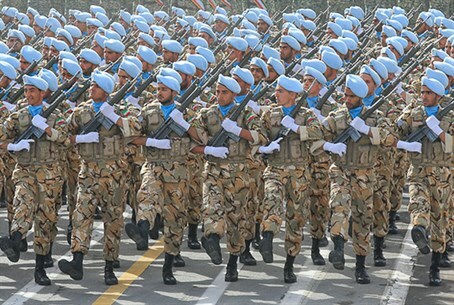 The commander, Brigadier General Hossein Salami, said that Iranian military commanders are prepared to attack and destroy “the Zionist regime of Israel” as soon as they receive such an order. Iran’s Supreme Leader, Ayatollah Ali Khamenei, has in the past threatened to "annihilate" the Israeli cities of Tel Aviv and Haifa. In February, the official site of the Iranian Revolutionary Guards warned the U.S. that its warships in the Persian Gulf were in range of their Karrar combat drones, as well as their Kowsar anti-ship missiles, both domestically produced. Several weeks ago, the commander of the Iranian Navy stated that his forces were trained to destroy U.S. warships.